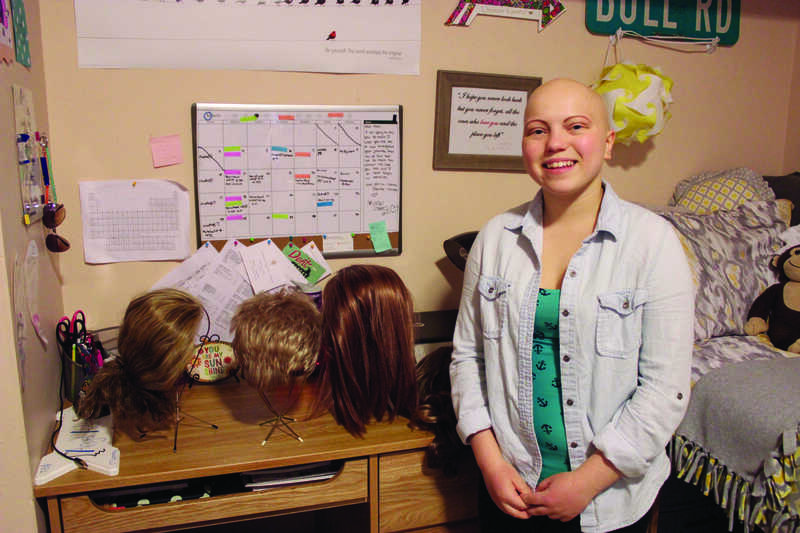 Freshman Nicole Zaleski poses with the variety of hairstyles she chooses from every day. Zaleski has alopecia, which caused her to lose her hair. Nothing seems to limit freshman Nicole Zaleski. She studies diagnostic imaging at Quinnipiac, is a part of QTHON’s Dancer Relations Committee and is a passionate member of the sorority Pi Beta Phi. In Zaleski’s spare time, she enjoys softball, painting and watching shows on Netflix. What someone may not detect easily is that Zaleski also has four medical conditions: Type 1 diabetes, Addison’s disease, hypothyroidism and alopecia. According to Zaleski, her friends and peers initially cannot believe she has so many conditions. Type 1 Diabetes made an appearance when Zaleski was 8 months old. The effects of diabetes have created a routine in her daily life. She checks her blood sugar throughout the day and gives herself insulin when needed. If her blood sugar is high, she will not eat until it goes back to down to the right level. It is also possible for her blood sugar to be high in the morning. With Addison’s disease, which Zaleski was diagnosed with at age 14, her adrenal glands (endocrine glands that produce hormones, such as adrenaline) do not work properly. She said that she takes pills for this problem every day in the morning and at night. It was after this incident that Zaleski learned she had Addison’s disease. Another condition that she has is hypothyroidism. It is a condition where the thyroid gland does not create certain necessary hormones, according to Mayo Clinic’s website. Zaleski has been taking an everyday pill for hypothyroidism since age 3. When Zaleski was 16 years-old and a junior in high school, her hair started falling out and she did not know why. After some tests, it was discovered that she had alopecia. Alopecia occurs when the immune system attacks hair follicles, which are the structures that hold the roots of the hair, leading to hair loss. The condition is not contagious, according to the American Academy of Dermatology website. Zaleski said her mom was worried about this condition more than she was. But Zaleski somewhat laughed at it. The fives wigs that Zaleski brought to school are brushed and normally kept on wig stands. For lab days, Zaleski usually picks the one that she has put into a bun. For going out, she usually wears her short wigs. Then, there is a curly wig meant for special occasions, such as formal or semi-formal. In addition, she lets her friends pick the wig for her most of the time. “It’s just like normal hair. 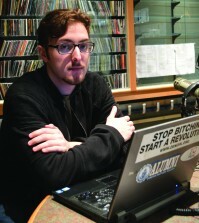 I mean, I don’t wash it as much,” Zaleski said. She said that she washes them about once every two months because she does not sleep with them on. Freshman Natasha Tenreiro, who is in Pi Beta Phi with Zaleski, said her sorority sister never really formally told her about this aspect of her life. But, Zaleski takes her wigs off all the time so Tenreiro eventually learned about the baldness. Tenreiro adds that Zaleski jokes about it frequently, making comments about how she does not have to shave because she has no hair on her body. Zaleski would not get offended if someone asked her if she is bald; she wants people to ask and be aware, something Tenreiro likes about Zaleski. But, Zaleski does not talk about her conditions often, according to Tenreiro. The top thing that Zaleski wishes people understood is that just because a person is bald, it does not mean he or she has cancer. However, like everyone, Zaleski has bad days. Her blood sugar can irritate her when she cannot put it back into target range. But, she combats this issue by taking a medical shot. Regardless, Zaleski tries her hardest not to let her conditions affect her social interactions. She said her natural confidence has helped her come to terms with her conditions. She believes that you eventually learn that people are going to judge and accept you. 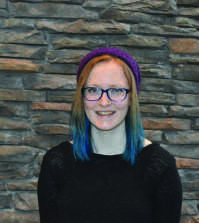 In order to be confident, Zaleski believes people need to be okay with being themselves. She said everyone is different and everyone has a story. Her story tends to be more focused on medical conditions, but other people’s stories could be different.